Surround your event or display tables with our 14 foot polyester white table skirts to give your wedding or events a formal presentation. 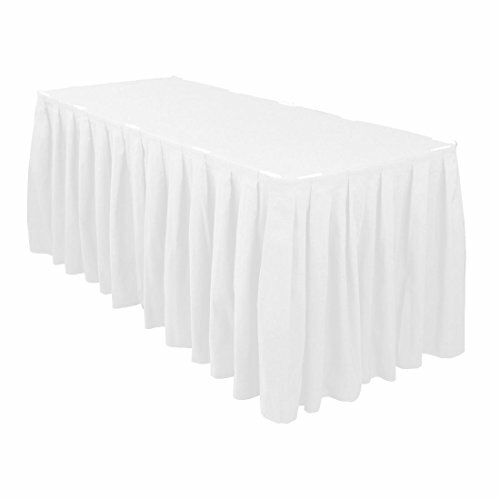 These durable, machine-washable table skirts are made of a heavier fabric than most other table skirts on the market. They are seamless, drop 30 inches to the floor, and feature a long strip of Velcro sewn inside the skirt for ease of attachment to our Table Skirt Clips. Skirt clips and table-top covers are SOLD SEPARATELY. If you have any questions about this product by LinenTablecloth, contact us by completing and submitting the form below. If you are looking for a specif part number, please include it with your message.